Whenever I hear people justify their actions and decisions because of the Bible, it pisses me off. It’s great that you believe in something/someone, after all it is the backbone to our laws. But it is wrong to enforce those religion based decisions onto others. There are wars over the holy land, we have child molestation charges against Priests. We have people killing people “in the name of the lord”. I think the religion thing still has a lot of room for improvement. We all have to understand that times have changed since the books of the Bible was written. I’m neither for not against Prop. 8. But I do think allowing gays and lesbians to be married would be a great way to stimulate the economy. Think about all money they would spend on their wedding! or how much they would spend on the divorce! I don’t like to voice my political views to people because I think it’s too personal. I keep my political opinions to myself for the same reason we vote inside covered booths instead of an open area. After viewing this I now fear for my life. These people in Ohio are nuts. It’s one thing to support McCain/Palin and not Obama/Biden, it’s a whole different thing when you verbally attack Obama by calling him a N@#$er and a terrorist. I used to think growing up in Los Angeles was tough. I think I would rather have money taped on my naked body walking through Compton than to show up at one of these rallies. Their ignorance is unbelievable! it’s almost 2009 and they are still stuck in the 50’s. If they saw me, they might haul me off to build railroads for them. 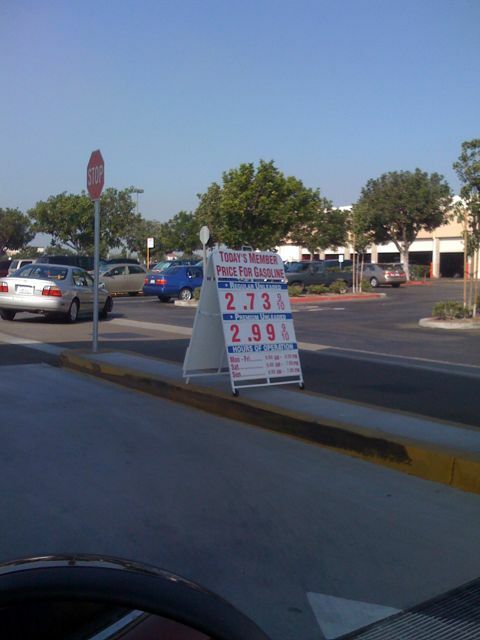 Short post: gas price at Costco in Fountain Valley, CA super low today! $2.74 / $2.99. I don’t remember the last time I saw a ‘2’. I’m so happy!